If you go online and look for the list of top badminton rackets, a lot of the options would be those that are from Yonex. Over the years, the company has cemented its reputation as one of the best, trusted even by the seasoned players. They have a wide selection of offerings and one worth considering is the Yonex Voltric 70. In many other reviews in the past, the Voltric 70 was hailed as one of the best because of its ability to offer the perfect combination of attack and defense. With this, despite the steep price, this is a favorite of many people. Will this be a good choice for you? Keep on reading the rest of this review and find out if this racket will offer an unmatched performance. Looking at the technical details of this product, it has an average weight of 83 grams, providing it with a 4U weight classification. On the other hand, the grip size is G4. The weight and the grip are typical to what you can find from most of the rackets from the manufacturer, which is why it won’t take too much of an adjustment if you have been an avid Yonex user. In terms of flex, on the other hand, this racket is stiff. This is also one of the reasons why this is more recommended for beginners than for seasoned players. If you are a novice in the sport, it will be better if you choose a racket that comes with a flexible shaft. Lastly, it is a head-heavy racket. Because much of the weight is found on the top part, you can expect that it will be able to generate more powerful smashes. Here are some of the benefits of this badminton racket, which can convince you to have it chosen over others. This is one benefit that is common amongst rackets with head-heavy construction. Because the head is heavier than the rest of the body, it is going to help generate more power and energy to send the shuttle to the other side of the court. 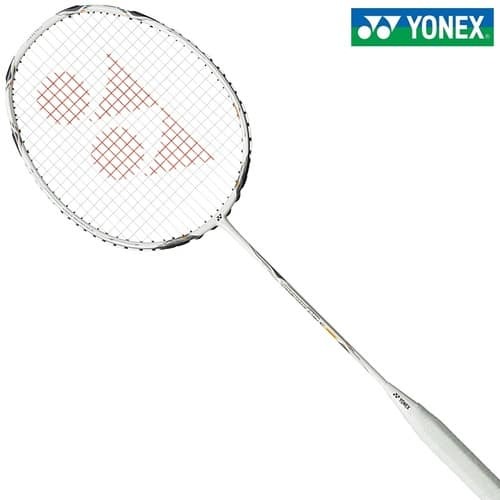 This racket has an isometric head, same with a lot of the other rackets produced by the company, such as Yonex Voltric 5FX and Yonex Arcsaber 9FL. The latter means that even if the shuttle does not hit the center, it will have the energy that it needs. If you are looking for a good racket for defensive players, this should be part of your list. It will make it easy to respond to the attacks of your opponent. There is no delay in reaction time, as long as you are also quick in your movements. Now that you are convinced that it is indeed a great racket, click on the image below and get it today! It should be noted, however, that it also has drawbacks that can give you hesitations in purchasing the racket. The most obvious downside of this racket is the steep price, which is why it is not for those who have a tight budget. If you want a racket that is cheap, two of the models I can suggest are Yonex Arcsaber Lite and Yonex Nanoray 10, although they are more of beginner rackets. The mere fact that it is a stiff racket will already give you an idea that this is not for novices. You will need to have a strong arm and wrist to generate enough power in every swing. If you want a racket that is easy to swing for beginners, Yonex Arcsaber 002 can be a good alternative. The main material used in the shaft of the racket is Ultra PEF. This is great not only for durability, but also for shock absorption. This means that vibration is significantly minimized, which is great for your comfort. It also improves stability. Similar to many other Yonex, it also has the innovative Tri-Voltage System, which allows it to deliver exceptional speed without having to compromise power. Lastly, it also has the Super High Modulus Graphite technology, which is the one responsible for enhancing the racket’s repulsion. Throwing clears with the use of this racket is almost effortless. Your clears will be indicative of generous power. It is unnecessary to make adjustments in your timing. Meanwhile, it should be pointed out that the drives are also astounding, whether defensively or offensively. Nonetheless, it performs better on the defense. Serving with this racket is also pretty much easy, although there are many others with lighter weight. When it comes to making smashes, power is the best asset of the Yonex Voltric 70. This is one thing that does not at all come as a surprise since this is a head-heavy racket. Lastly, it is also able to deliver agile swings, allowing you to instantly respond to your opponent. However, Yonex Voltric Z Force 2 is still faster. From the price and the features of the racket, it is pretty much obvious that this is for those who are already experienced in playing badminton and who do not mind spending a fortune just to enjoy a high-quality product. This is for those who like to make aggressive hits, surprising their opponents with their every move. This is for both attackers and defensive players. In sum, the Yonex Voltric 70 is an expensive racket, but the steep price is sure to be worth it. It is designed with the needs of experienced players in mind. It can offer the benefit of speed, power, and control, making it a great choice for an all-rounder racket. To top it all, it is made of premium materials and has innovative technologies that will guarantee its longevity. Is this the racket that you have been looking for? Click the button below and get it today at a deal that you will find hard to resist!